In July this year, we hit 100! We recruited our 100th employee to our growing business. 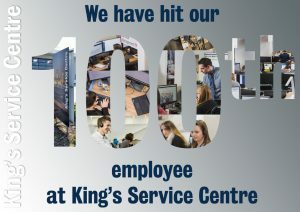 We’re now well over the 100 mark and are continuing to recruit into our expanding and exciting business. If you don’t know what we do here, we support King’s College London by providing first line IT support to the 35,000 strong community of students, researchers, professional staff and academics. This is a 24 hour, 7 days a week service, that operates 365 days a year. We’re also the home of the Estates and Facilities Service Desk and other technology teams. King’s is a world leading university, and the work we do allows King’s to maintain this and supports the growth strategy and King’s Vision 2029. King’s Service Centre (KSC) brings highly skilled IT career opportunities into Cornwall, by recruiting locally, and investing in staff through training and development as well as graduate and apprenticeship opportunities. With our office based in Quintdown Business Park near Newquay, we’re in a fantastic location, being 5 minutes from the beautiful Cornish beaches and all the local amenities that Newquay town has to offer. KSC also has an active social committee providing several fun events and fundraising activities throughout the year, as well as the sustainability committee who recently won the NUS Silver Green Impact Award, and regularly attend local beach cleans such as the upcoming Fistral Beach Clean in Newquay. Other staff benefits include free tea, coffee, and fruit, free parking on site, bike racks, dress down Friday’s and eligibility for the NUS card. We have a number of opportunities available now, and welcome applications from skilled professionals who would like to join our team. Click here to see our current vacancies, or you can send in a speculative CV to hello@ksc.ac.uk.